Waves' latest analogue emulation has unrivalled pedigree. But is there still a role for a mixer that was declared obsolete 40 years ago? Some 80 years after its opening, EMI's Abbey Road Studios remains one of the world's leading recording facilities. Such is its fame that it has also become a potent brand name: whether it be T-shirts, coffee-table books or online mastering services, we expect something a bit special from anything that bears the Abbey Road moniker. 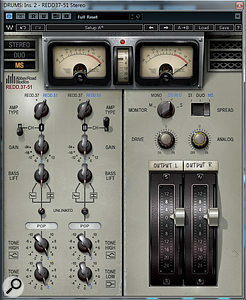 The commercial exploitation of the Abbey Road brand has already brought us a number of software plug-ins. Some, such as the RS124 compressor or TG12413 limiter, model classic pieces of hardware from the studios, while others present samples recorded there, such as Native Instruments' Abbey Road Drummer series. The newest entry into the former category is perhaps also the most ambitious: Waves have officially modelled channels from the famous REDD consoles that were used to record many classic '60s records, including nearly all of the Beatles' output. The history of these consoles is well-known, and is documented on the Waves site in more detail than I have space for here, but a brief summary is perhaps in order. EMI staff, accustomed to commissioning and building their own equipment, acknowledged in the mid-'50s that the rise of stereo would bring about a need for more sophisticated mixing desks, and set about designing the first REDD desk. 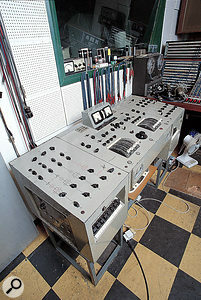 Several subsequent iterations were produced before the valve-based REDD consoles were eventually phased out in favour of the solid-state TG-series desks in the late '60s. Waves' plug-in suite models three of these iterations: the early REDD.17 and its successor, the REDD.34, both of which employed Siemens V72 valve preamps, and the later REDD.51, which used a different amp module and offered more headroom with lower distortion. The Abbey Road REDD suite is compatible with most hosts on Mac and PC; at the time of writing, Waves have just committed to supporting Avid's AAX Native format, but Pro Tools compatibility is RTAS-only for the time being. Waves have, however, introduced yet another authorisation scheme with their version 9, abandoning iLok in favour of their own Waves License Center system. This stores your licences on a standard pen drive, thus tying up yet another USB port, but perhaps appealing to those who resent the cost of an iLok key. As before, you can install individual plug-ins on a machine connected to the Internet, but off-line installation requires you to download the entire version 9 installer, which is nearly 1GB in size. The REDD.37 and REDD.57 channels have a deeper range of EQ cut/boost settings and a generally cleaner sound. Unlinking the stereo channels, as shown here, adds life and movement to the stereo field. Console emulation plug-ins have been in the spotlight lately, thanks to Slate Digital's VCC and Waves' own NLS, among others, but it's fair to say that the Abbey Road REDD suite takes a slightly different tack. For one thing, it only emulates individual mixer channels: there's no equivalent to VCC's Virtual Mix Buss plug-in that would emulate the summing bus. For another, REDD models not only the non-linear response of the amp circuitry, but also the equalisation built into the TG-series desks. Finally, whereas VCC and NLS incorporate ganging features that allow many instances of the plug-in to be controlled from a single master, the Abbey Road REDD plug-ins are strictly solo affairs. The aforementioned EQ facilities are common to all three versions and consist of high and low shelving EQs, plus a three-position switch engaging either a pad or a Bass Lift feature. The latter has almost infinite potential to trip up people who don't read manuals: I assumed it was a high-pass filter, but it turns out to be the exact opposite, adding a hefty low-frequency boost when in circuit. This was originally intended to compensate for the falling bass response of capacitor microphones operating in figure-8 mode (bear in mind that close-miking was not the norm when these consoles were built). No two channels on an original REDD desk would sound exactly alike, and if you use the stereo version of any of the REDD plug-ins, you have the option of using matched or unmatched emulations for the left and right channels. There's also a built-in M/S matrix, which allows the differences between the emulations to manifest themselves more symmetrically. All that remains is a slightly confusing collection of gain controls. First in line is Gain, which sets the input gain. Then there's a Drive control, which adjusts the amount of saturation that's applied. Then, not forgetting the switchable pad mentioned above, you have Waves' familiar Analog 'hiss and hum' dial, and finally a very pretty virtual fader, which acts as an output gain control. Neither the input Gain control nor the fader are part of the modelled analogue circuit: they are simple digital gain controls, the heavy lifting being done by the Drive control. The idea is that you balance the Gain and Drive controls to set how hard the virtual circuit is driven, and then use the fader to compensate for any ensuing level boost or reduction. This can take time to get right, and I wasn't entirely clear why separate Gain and Drive controls were deemed necessary, given that comparable plug-ins such as SoundToys' Radiator manage fine with just input and output gain controls. And since Waves' design team have been willing to leave authenticity behind in this respect, I wish they had also given us the option to make the VU meter pre-fader. Its fixed post-fader position mimics the original's arrangement, but in this context means that as soon as you move the fader away from zero, it stops being useful as a guide to how hard the modelled circuitry is being hit. In my first experiments with the Abbey Road REDD plug-in, I tried using REDD.17 on every channel in the mix, as one would with VCC. My first reaction was to form an even higher opinion of the engineers who had to use these desks to make listenable records! Depending on the source, the range of settings where the effect falls into the category of 'pleasant warmth' rather than 'fuzzbox' can be quite narrow. I rarely wanted to turn the Drive up beyond the first quarter of its travel, and on sources such as vocals and acoustic guitar I struggled to get things to sound clean enough even at the lowest Drive setting, often ending up with the Gain control turned way down. Even then, I would find occasional peaks hitting some sort of headroom barrier and distorting audibly. It's quite a balancing act when mixing down in a modern DAW, and I can only imagine the challenges Norman Smith faced in having to get Lennon and McCartney onto tape without distorting them or burying them in hiss. That said, once I'd got my Gain and Drive sufficiently under control, I liked what REDD did to the first project I tried it with, which was a sparse folk recording of voices, acoustic guitar, piano and tin whistle. Everything thickened up nicely, helping to fill out some of the corners left by the basic arrangement, and the simple high and low shelving filters did an excellent job of beefing up a slightly lean bottom end and adding some sparkle in the high-frequency range. It's particularly hard to escape obvious distortion when using it on the master bus, but the results sound great when you manage it. Comparing the three versions, it also becomes clear that REDD.51 is significantly cleaner than its predecessors, with quite a bit more usable headroom (and a much more potent EQ). Moving on to a denser rock track, I soon decided that the approach of using it on every channel wasn't really worth pursuing. It takes much longer to set up a mix with REDD than with VCC, partly because you have to be more careful with the gain structure, and partly because there is no way to gang controls across multiple instances. This also means that there's no easy way to switch between the different REDD emulations all at once, or bypass them all for A/B comparison, unless your host DAW mixer makes this possible. On the plus side, sources such as drums and electric guitars are much more forgiving of being driven into distortion and, as you'd expect, often respond well to doing so. One feature that surprised me is the extent to which switching from linked to unlinked stereo changes the sound. I often found that the unlinked setting audibly brought tracks to life, especially in L/R mode: the signal seems to acquire a real liveliness and bounce, without any obvious negative impact on imaging. Perhaps the contribution of inter-channel differences to the mysterious phenomenon known as 'analogue warmth' is greater than we think. In a rock context, perhaps the greatest strengths of REDD are at the low end. Even when you don't use the EQ, the saturation seems to bring out the weight and punch of drums and bass guitars, and the low shelving filter is often perfect for adding just that extra helping of beef. The Bass Lift function is a bit of a secret weapon in this respect, too. It may be modelled on vintage hardware, but REDD definitely has a place in modern music styles. 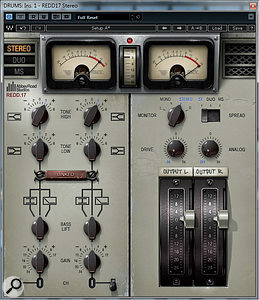 Whereas VCC is something you'd use for its cumulative effect — subtle to the point of inaudibility on individual channels, but a noticeable help when trying to combine many channels into a coherent mix — Abbey Road REDD is more obviously a 'character' effect you'd want to apply to individual sources or buses. With today's channel counts, it's not hard to go too far and end up with a mix that is simply too thick and soupy, and the lack of ganging across multiple instances becomes a pain when you have more than half a dozen or so to contend with. Ultimately, though, the occasional frustrations are simply side-effects of what it does: REDD is designed to be a warts-and-all recreation which adds bags of character, and it does exactly that. All we need now is a plug-in that can lovingly recreate the sound of repeated bounces to a four-track tape recorder. And a virtual George Martin. Models three different versions of the REDD console. The EQ is simple but very effective, and sounds great. Brimming with character, and useful for modern as well as retro sounds. It's not possible to control multiple instances of the plug-in from a single master. Careful setting of controls is often needed to avoid obvious distortion. The VU meter would be less authentic pre-fader, but more useful. Abbey Road REDD brings all the 'analogue warmth' you could ever need, even if it's sometimes a struggle to keep it under control!